Intensity of Marijuana Enforcement Declining, Keith Humphreys Says. Academic marijuana policy watcher and addiction specialist Keith Humphreys reports that even though marijuana use is up -- measured by total days of use nationwide -- the intensity of enforcement -- measured by overall arrests divided by total days of use -- is down by as much as 40%. Humphries attributes it to decriminalization and medical marijuana, but also notes that such policy changes often merely formalize what is already occurring on the ground. Texas Legislature Will Be Faced With Marijuana Reform Bills Again This Year. Two Democratic Texas legislators say they will reintroduce marijuana decriminalization and medical marijuana bills that have gone nowhere in past sessions. Rep. Harold Dutton Jr. (D-Houston) will try for a fourth time to get a bill to decriminalize the possession of under two ounces passed, while Rep. Eliot Naishtat (D-Austin) will try for the seventh time to get his medical marijuana bill to a House floor vote. Marijuana Legalization Bill Filed in Oklahoma. State Sen. Constance Johnson (D-Oklahoma City) has pre-filed a marijuana legalization bill, Senate Bill 2116. The bill would legalize possession of up to an ounce and allow for the regulation and taxation of marijuana commerce. The legislative session begins February 3. Here's what she's up against: Mark Woodward, with the Oklahoma Bureau of Narcotics, said, "I've seen it wreck more lives than any other drug." Michigan Bill Targets Patients Who Are Parents. Republican state Sen. Rick Jones (R-Grand Rapids) has introduced a bill designed to make it easier for the state to remove children from the homes of parents who are medical marijuana patients. Senate Bill 736 would allow judges to inspect parents' medical records to see if medical marijuana use is "appropriate" and, if the judge decides it is not, to order the parent to stop using marijuana or designate him or her an unfit parent. Jones said he introduced the bill after hearing complaints from judges. "They want it clarified that they do have the power, as judges, to consider whether or not there's medical marijuana in the home and that there will be access to children and problems," he said. Meetings on Hawaii Medical Marijuana Law Coming to Hilo, Pahoa. The Drug Policy Action Group and the Medical Cannabis Coalition of Hawaii are holding meetings later this month in Hilo and Pahoa to provide information and get public input on what's right and what's wrong with the state's medical marijuana law, as well as discussing broader marijuana policy reform. Click on the link for details. North Carolina Harm Reduction Coalition OD Prevention Program Gets Noticed. The North Carolina Harm Reduction Coalition (NCHRC) was crucial in getting comprehensive drug overdose prevention laws passed in Raleigh last year, and now they are getting both results and national notice. Click on the title link to read more and see video from CNN and Fox News Charlotte about the laws and the successful use of naloxone to reverse an overdose. Obama Marijuana Remarks Spur Finnish Debate. President Obama's weekend remarks on marijuana are spurring debate on marijuana law reform in Finland. "The USA is the number one country in the war on drugs, so if it begins legalizing the use of marijuana, it will surely have a major effect on Europe," sociologist Jussi Perala said. "Making marijuana legal in Finland is utopic, but at some stage something should happen about it. In Finland, harsh punishment can be meted out merely for the intention to use drugs," he said. Last Tuesday, Merced County supervisors approved a grow ordinance that would regulate the number of plants grown for medical marijuana users. The ordinance limits each site to 12 plants, which can be grown either indoors or outdoors. The ordinance considers anything more than 12 plants a nuisance, with fines of $1,000 a day, but which could escalate to a $1,000 per plant per day. The ordinance goes into effect on October 10. Last Thursday, San Diego Interim Mayor Todd Gloria ordered that enforcement of medical marijuana zoning restrictions be resumed. Former Mayor Bob Filner, who supported medical marijuana, refused to enforce the city's zoning ordinances, but he was forced from office following a series of sexual harassment allegations. Gloria said that while enforcement was resuming, a draft medical marijuana ordinance is in the works and could go before the city council early next year. Dozens of dispensaries had been shut down under former Mayor Jerry Sanders, but many reopened during Filner's tenure. Now, they are in jeopardy if they continue to operate. Last Friday, a bill to regulate medical marijuana operations statewide died in the legislature. The bill, Assembly Bill 605, had been killed earlier in the session, but was revived in a last ditch effort to pass it this year. It died, however, in the face of opposition from law enforcement lobbyists. It would have created a new department to register commercial medical cannabis growers and sellers and codify as law the Attorney General's guidelines on medical marijuana. On Tuesday, the Murrieta city council voted to maintain its eight-year ban on dispensaries. The 3-1 vote also extended the ban to include delivery services. The mayor said dispensaries would threaten the community, while council members complained of a lack of clear regulation from the state and federal governments. On Monday, the San Leandro city council voted to proceed with a draft dispensary ordinance that would allow two dispensaries to operate in the East Bay city of 86,000. Monday's action came nearly a year after the city's latest moratorium on dispensaries expired. The city council issued a yearlong moratorium on dispensaries in 2010, and again in 2011, a prohibition that expired Sept. 30, 2012. Last Thursday, Gov. Martin O'Malley appointed members to the state's Medical Marijuana Commission. The commission has the authority to permit academic research centers to design and implement programs to make marijuana available for medical purposes to defined groups of patients. The panel will be chaired by Dr. Paul Davis, president of Advanced Pain Management Specialists, which has eight locations in Maryland. The commission holds its first meeting next Tuesday. On Tuesday, the Braintree town council voted unanimously for a one-year moratorium on dispensaries. Council members said the moratorium would give them time to draft zoning regulations and ordinances. On Wednesday, the State House News Service reported that at least 115 municipalities have passed temporary dispensary bans or moratoria. Others are considering similar measures and still more have drafted new zoning laws determining where they can locate. Last Wednesday, criminal charges were reinstated against 16 people arrested in a raid of the Clinical Relief Dispensary in Ferndale. The dispensary was raided in August 2010, but charges were initially dropped by a lower court. A State Court of Appeals ruling allowed them to be reinstated. Prosecutors say that the law does not allow for setting up dispensaries to sell marijuana. On Tuesday, dozens of people gathered in Lansing to protest the removal of a young child from parents who are medical marijuana users. Six-month-old Brielle Green was taken by Child Protective Services, and protestors said her case was merely one among dozens in which state caseworkers have disregarded protections in the medical marijuana law while trying to remove children from parents who are registered patients or caregivers. Green's parents said the CPS decision to take the child arose out of a custody/visitation dispute between the girl's mother and her ex-husband, who filed a complaint saying the home was unfit for children. Last Thursday, the state approved a $357,000 loan for a dispensary. The state Economic Developmental Authority approved the loan to the founders of a medicinal marijuana dispensary in Egg Harbor Township that plans to open in mid-October. Compassionate Care Foundation Inc. said it would use the money to buy equipment and expand its cultivation space, add 12 good-paying jobs to the seven it has already created, and eventually produce enough medicine for about 1,500 patients a month, said CEO Bill Thomas, formerly a medical researcher. Within ten years, the dispensary expects to generate about $2.8 million in state sales tax, he added. Last Monday, two lawmakers said they would introduce a medical marijuana bill after legislation failed to get out of committee for the past two years. The new bill would create a medical necessity defense for patients. Sen. Jon Erpenbach (D-Middleton) and Rep. Chris Taylor (D-Madison) plan to introduce the legislation sometime this session but have not yet set an exact date. Idaho is officially not a marijuana-friendly state. Although it is bordered on most sides by medical marijuana states (Washington, Oregon, Nevada, and Montana), it so far refuses to accept the medicinal use of the herb. And even though one of those states (Washington) has legalized marijuana and two others (Nevada and Oregon) have decriminalized it, Idaho remains firmly grounded in 20th Century attitudes toward the plant. The state legislature this year took the time to approve a non-binding resolution noting its opposition to marijuana legalization. But that doesn't mean there aren't reformers in the Gem State. There have been sporadic local marijuana legalization efforts in past years, and this year, medical marijuana supporters are in the midst of signature-gathering campaign to put an initiative on the ballot. That campaign is led by Compassionate Idaho, some of whose most stalwart and publicly visible members are Lindsey and Josh Rinehart and Sarah Caldwell. But with an incident that began while Caldwell and the Rineharts were away on a retreat, the trio are learning a harsh lesson in hardball pot politics. When they got back home, their kids were gone, and the police and child social services had them. According to Boise Police, who released a statement on the matter as controversy grew, on April 23, they were contacted by a local school official about a child who had apparently eaten marijuana and fallen ill. Police "learned from witnesses" that the supposed marijuana supposedly came from the Rinehart residence, and, "concerned for the safety of children at the residence," they went there and found a baby sitter caring for the Rinehart and Caldwell children. Police persuaded the baby sitter to let them search the residence and "found drug paraphernalia, items commonly used to smoke marijuana, and a quantity of a substance that appeared to be marijuana in locations inside the house accessible to the children." Police at the scene then contacted both narcotics investigators and the department's Special Victims Unit. "Based on the fact that illegal drugs and drug paraphernalia were located in an area that appeared to be commonly used by the children in the residence and the fact that one child had already become ill from ingesting what he assumed was marijuana, and the inability to contact the children's parents, detectives made the decision to contact Idaho Health and Welfare officials and place the children in imminent danger, meaning they were placed in the protective custody of the state until it can be determined they are in a safe environment," the statement said. At this point, it is unclear whether whatever made the school child sick was marijuana. It is equally unclear that any marijuana came from the Rinehart residence. What is clear is that both the Rineharts and Sarah Campbell are up-front, in-your-face medical marijuana patients and activists, and that their children were being subjected to the tender mercies of the state. Sarah Caldwell has had her kids returned to her -- it was not her child who is suspected of providing the suspected marijuana -- but the Rineharts are still fighting to get their kids returned. 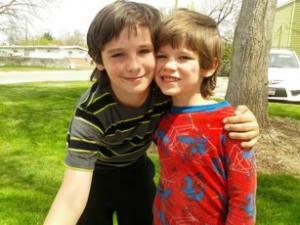 "My sons were not involved," Caldwell said. "They were at the house the police searched, the police decided my kids were in 'imminent danger,' and it took three days to get them back." While the two boys and the Rinehart kids were held at the same foster home, providing them with the small comfort of being with friends, Caldwell said her younger son was traumatized. "My six-year-old is autistic," she explained. "I noticed when he came home, he started packing his favorite toys. I asked him why and he said, 'In case the police make me go away again.' He doesn't understand why," Caldwell said, her voice breaking. While Caldwell has her children at home again, both she and the Rineharts are going to have to comply with the requirements of the child welfare system to ensure that their children can return to their old lives. But, Lindsey Rinehart said, Child Protective Services is moving more quickly than usual in her case. Sarah Caldwell's boys are back at home now, but the Rineharts are still waiting to get theirs back. Normally, Child Protective Services requires parents to meet with them at the department three times, then allows them to have three visits with their children in the community, then inspects the home to ensure a safe environment is being provided, and only then considers returning the kids, most likely with the added provision that the parents must undergo parenting and drug education classes. But when the Chronicle last spoke to Rinehart Saturday, she was in the middle of a home visit with her kids -- one that ends Sunday morning. "They seem to be expediting the process because they realize they messed up," she said. The state taking her kids wasn't doing them any favors, she added. "My oldest son now will only talk if you ask him really specific questions, and my younger one is acting out," she said. "He is upset and argumentative; he has a hard time vocalizing things," she said of her six-year-old. "I told him I had to go to the store, and he freaked out; he didn't want me to leave him. He's reacting like I've never seen before. He was a happy kid; now he's mad and confused. He doesn't understand what's going on." The older Rinehart son is having issues, too, she said. "He's mad. Both of the kids have been educated about my medicine, so they know this is wrong," the multiple sclerosis sufferer explained. "They're mad that they were taken away because mommy had her medicine. I'm trying to comfort them as best as I can. They just know that somebody took them away, and now I have to explain that they have to go back to foster care tomorrow," Rinehart said, her voice trembling. Both the Rineharts and Sarah Caldwell suspect they were set up. "I'm the director of Compassionate Idaho. Everybody knows who I am. I'm on the news at least once a month," said Rinehart. 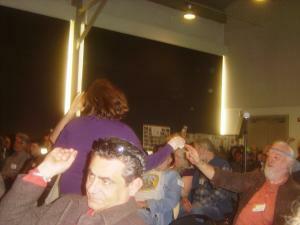 "We had just done the Hemp Fest in Moscow and signature-gathering in five towns. The police knew what they were looking for, and they knew where to look without anyone telling them. Those kids on the playground didn't know where to look. There were kids from several other families involved in that playground incident, but we think the police got who they wanted." "I do think they were targeting us," Caldwell agreed. "That incident at the school was just an excuse for them to try to get us." "This has got me fired up," Caldwell said. "They took my children to try to keep me focused on getting my kids back so I wouldn't do my activism, but I'm not going to stop." The use of children as pawns in the marijuana culture wars is shocking and distressing, but nothing new, said Keith Stroup, founder and currently counsel for the National Organization for the Reform of Marijuana Laws (NORML). "We get calls three or four times a week from people who have lost custody of their children because they tested positive at birth or in a situation where parents are feuding over custody," Stroup said. "One will say 'My spouse smokes marijuana and is thus not a fit parent,' and once that child welfare issue is raised, it's a totally separate matter from the criminal justice system. Even if no one is proposing to arrest the parent, this is far more damaging and destructive to the family." That's at least in part because once child welfare has its clutches on you, it doesn't want to let go, and it typically has an attitude toward marijuana use that is reminiscent of Reefer Madness, Stroup said. "They can require that you take parenting and drug education courses right out of the 1950s," he said. "It's a worthless routine, but you have to do it, you have to pay hundreds of dollars to do it, and you can't get your kids back until you do it. It doesn't matter how nice or good a parent you are or how well-intentioned you are, once you get caught up in this, you are in for a bad time." NORML is doing what it can to assist the Idaho activists, Stroup said, adding some words of advice for other marijuana-using parents, especially (but not only) in places where attitudes toward the herb are hide-bound and hardened. "If you're in a place like Idaho and you're a young parent, never smoke in front of your kids, so if that issue ever arises, you can make sure nobody can say you were smoking marijuana and kids were playing in the same room," he counseled. "You have to be able to demonstrate convincingly that you are providing a safe and secure place for your kids. In places like Idaho, you could lose custody over your kids for something many of us in many parts of the country take for granted." Getting the kids back is only part of the problem for the Rineharts. Idaho treats even small-time pot possession seriously -- it's one of those place where people still actually do get jail time for it -- and the couple is facing possible felony charges for possessing more than an ounce of trim. 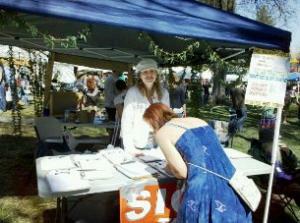 Lindsey Rinehart tabling at the Moscow Hemp Fest just days before it all went down. "I'm living in an ongoing panic attack," said Lindsey Rinehart. "They update their warrants every five hours, so I check in frequently, and first thing in the morning. Because of my illness, I can't handle physical pressure very well, and I'm afraid they could hurt me when arresting me, so my lawyer has asked that if they do charge me, they just cite me." All the stress isn't helping, and now, Rinehart can't have her medicine, either. "I have prescribed meds to suppress my immune system, but those make me really sick. With cannabis, I only had to take it every other day," she explained. "Now, I have to take it every day, and it's so dangerous we have to regularly check my heart, liver, kidney, and eye function. And if I have pain, I'll have to go back to hydrocodone. I'll be going back on those meds I had been able to taper down from with cannabis." But despite the trials and tribulations, neither the Rineharts nor Sarah Caldwell have been cowed, and their travails have energized supporters as well. "People are really mad about this and are getting involved," said Rinehart. 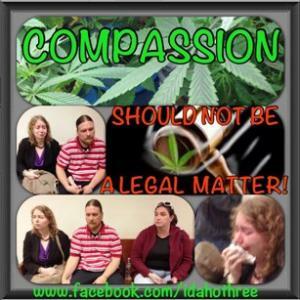 "We even have people reaching out to help fund Compassionate Idaho. "People are coming out of the woodwork after hearing our kids got taken because of our activism," said Caldwell. "People are saying they want to help. Education is key here -- a lot of people here believe the Reefer Madness, but this is a non-toxic plant; it can't hurt you." "The bigger picture is that we don't want this to happen to more families," said Rinehart. "We're getting more calls than we ever did about child custody," Stroup reiterated. "There are still people being seriously damaged from what's left of marijuana prohibition. Few go to jail for marijuana anymore, but many lose custody of their kids. These repercussions may be more subtle, but they are not insignificant." The Rineharts and Sarah Caldwell still have to deal with Child Protective Services, and the Rineharts are still waiting to see if they will face criminal marijuana and child endangerment charges. But in the meantime, there are 55,000 signatures to be gathered to get medical marijuana on the ballot and start changing Idaho's reactionary response to marijuana. If the first day of the California NORML state conference is any indication, most of the major players in Golden State marijuana law reform are lining up behind the idea of waiting until 2016 to try another legalization initiative there. They have some good reasons, but not everybody's happy with that, and some heart-rending reasons why that's the case were also on display as California marijuana activists gathered in San Francisco for day one of the two-day event. Richard Lee's groundbreaking Proposition 19 garnered 46.5% of the vote in the 2010 off-year election, and no marijuana legalization initiative campaigns managed to make it onto the ballot last year, although several groups tried. Meanwhile, Colorado and Washington beat California to the Promised Land, becoming the first states to legalize marijuana in last November's election. Now, California activists are eager to make their state the next to legalize, but crafty movement strategists are counseling patience -- and trying to build their forces in the meantime. The Prop 19 campaign made a strong beginning, bringing in elements of organized labor and the black and Hispanic communities, as well as dissident law enforcement voices, to help form a coalition that came close, but didn't quite make it. As CANORML deputy director Ellen Komp reminded the audience at a Saturday morning panel on what comes next for marijuana law reform, the people behind the Proposition 19 campaign have formed the core of the California Coalition for Cannabis Policy Reform in a bid to forge unity among the state's diverse, multi-sided, and sometimes fractious marijuana community -- and to encourage new voices to join the struggle. For the Marijuana Policy Project, California is a big prize, but only part of a broader national strategy, and one that should most likely wait for 2016, said the group's executive director, Rob Kampia, as he explained its plan to push legalization bills in state legislatures in four states (Hawaii, New Hampshire, Rhode Island, Vermont) this year and beyond, but not pushing legalization initiatives anywhere but Alaska in 2014. "There's a big demographic difference between 2014 and 2016," said Kampia. "If we do 2016, it's ours to lose." The Drug Policy Alliance, another major player with access to the big-time funding that can turn an initiative into a winner, also seemed to be looking to 2016. "It's up to us how, where, and when marijuana prohibition will end," Steve Gutwillig, a DPA deputy executive director and former California state director told the full house at the Ft. Mason Conference Center, "but the presumption is 2016, more than 2014. We need to run a unified campaign, we need to build the base and do alliance-building among people who are already convinced." Those positions are in line with the thinking of long-time CANORML head Dale Gieringer, who has long argued that initiatives fare better in presidential election years. Even some of the proponents of the competing initiatives from last year are, while not exactly enthusiastic about waiting for 2016, are seemingly resigned to it. 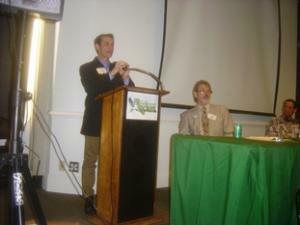 Steve Collette, who was a proponent of the Regulate Marijuana Like Wine initiative, told the Chronicle he would prefer 2014, but could get behind 2016, too, while Sebastopol attorney Omar Figueroa, coauthor of the Repeal Cannabis Prohibition Act initiative, implied in his remarks in a later panel that he, too, was resigned to waiting for 2016. Noting the confused state of California's medical marijuana laws -- "Nobody knows what the laws are!" -- Figueroa argued for either legislative action or a 2014 medical marijuana initiative "until a legalization initiative in 2016." Not everyone was as ready to give up on 2014 just yet. Displeased grumblings were heard in the hallways, and an earnest advocate for the Herer-ite California Cannabis Hemp Initiative 2014 took advantage of a post-panel question-and-answer opportunity to declaim in support of it. The most powerful and visceral opposition to waiting came in the form of Daisy Bram, a mother of three young children and legal medical marijuana grower. Bram became a symbol of the cruelty of pot prohibition last year, when local authorities in rural Butte County raided her grow, seized her children and place them in foster care, and filed criminal charges against her. Despite being counseled to comply with the demands of Child Protective Services officials in order to secure the return of her children, one of whom was quite literally torn from her arms, Bram fought back and eventually won the return of children. But just this past week, it happened again. Another raid in another county -- although led by the same investigator -- has resulted in new criminal charges and her children once again being taken by the state. "My kids need you," she told the hushed crowd. "If it were legal, they wouldn't have my kids." Daisy Bram doesn't want to wait until 2016 for marijuana to be legalized, she wants it yesterday, and she wants justice, and, most of all, she wants her children back in her arms. Her brief presentation at a panel Saturday afternoon was chilling, impassioned, and powerful, and visibly moved many in the audience. And while California is a state where just about anyone can get a medical marijuana card and possession of under an ounce is decriminalized, the case of Daisy Bram makes the uncomfortable point that marijuana prohibition continues to exact a real toll on real people, including the innocent. It's not just mothers labeled child abusers because the grow pot; it's also fathers denied visitation, patients thrown out of public housing, workers who must choose between their medicine and their jobs. It's a bit easier to be sanguine about waiting until 2016 when you're not the one being bitten by those lingering vestiges of prohibition. 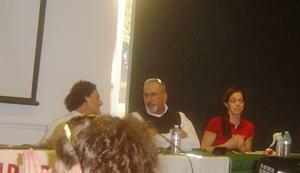 As Komp put it when introducing Bram, until there is legalization, "there is a lot of human rights work to be done." On this Mother's Day, more than 100,000 women are behind bars in American prisons, according to the Bureau of Justice Statistics, and many of them are doing time for drug offenses. That's too many, said members of a new coalition, Moms United to End the War on Drugs, as they held events last week in the days running up to Mother's Day. 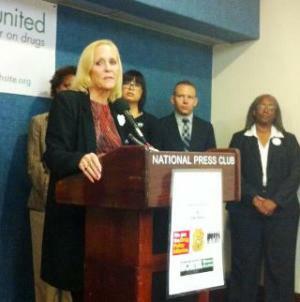 "The war on drugs is really a war on families," said Mom's United's Gretchen Burns Bergman. "It is time to end the stigmatization and criminalization of people who use drugs and move from arrest and mass incarceration to therapeutic, health-oriented strategies. Moms were the driving force in repealing alcohol prohibition and now moms will play a similar role in ending the war on drugs." Bergman, from San Diego, is the mother of two sons who have struggled with substance abuse and incarceration and is a founder of A New PATH (Parents for Addiction Treatment & Healing). A New PATH has joined forces with other groups, including Law Enforcement Against Prohibition (LEAP), the NORML Women's Alliance, Families to Amend California's Three Strikes, and Students for Sensible Drug Policy to form Moms United to agitate for an end to the drug war and a turn toward sensible, evidence-based drug policies. The week leading up to Mother's Day was a week of action under the rubric of Cops and Moms Working Together to End Prohibition. The week saw events and press conferences in Atlanta, Boston, New York City, and Washington, DC, in the East and Los Angeles, San Diego, Oakland on the West Coast. "Mother's Day was derived out of an intensely political effort to organize women on both sides of the Mason-Dixon Line against the Civil War," said Sabrina Fendrick, coordinator for the NORML Women's Alliance. "The reason mothers were made the vehicle was because they were the ones whose children were dying in that war. Women were also largely responsible for ending alcohol prohibition. This is more than just a ‘greeting-card holiday,’ this is the beginning of an institutional change in our society. The government's war on drugs is unacceptable. For our children's sake, the concerned mothers of the world are being called on to demand the implementation of a rational, responsible, reality-based drug and marijuana policy." Last Wednesday, at a San Diego press conference, the umbrella group unveiled the Moms United to End the War on Drugs Bill of Rights, a 12-point motherhood and drug reform manifesto which calls for "the right to nurture our offspring, and to advocate for their care and safety" and "the parental right to policies and practices that recognize addiction as a disease in need of treatment, rather than a willful behavior to be criminalized," as well as the right to have harm reduction and overdose prevention practices implemented, the right to be free from heavy-handed, constitution-threatening drug war policing, and the right to be free from drug war violence. "If we stop arresting and incarcerating drug users, think of the number of children who would have the chance to look upon their parents as positive role models instead of having parents who are absent because they are incarcerated," the group said. "We have a moral and ethical obligation to give these children a better chance in life by allowing parents to take care of their families. These parents should have the opportunity to become the productive members of society and role models to their children that they want to be and that their children need and deserve." The Bill of Rights has been endorsed by a number of religious, reform, and civil rights groups, and individuals can sign onto it, too. To sign on, go to the online petition. "We are building a movement to stop the stigmatization and criminalization of people who use drugs or are addicted to drugs," the group said. "We urgently call for health-oriented strategies and widespread drug policy reform in order to stop the irresponsible waste of dollars and resources, and the devastating loss of lives and liberty." 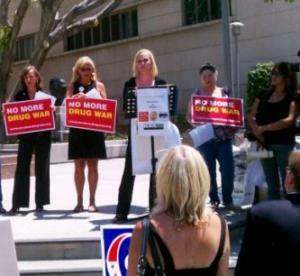 It's not just Moms United who is using Mother's Day to strike a blow for drug reform. 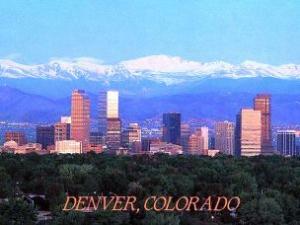 In Colorado, where Amendment 64 to legalize and regulate marijuana is on the ballot, the Campaign to Regulate Marijuana Like Alcohol is running a television ad featuring a young woman writing an email to her mother in which she explains that she has found her marijuana use to be safer and healthier than the drinking she did in college. The ad is aimed at a demographic that is both critical to and difficult for the campaign: women in their 30s and 40s, many of whom are mothers. The ad appeared Friday and again on Mother's Day. "Our goal with the ad is to start a conversation -- and encourage others to start their own conversations -- about marijuana," Betty Aldworth, the advocacy director for the campaign. And it's not just the United States, either. In mother-honoring Mexico, which marked Mother's Day on Thursday, hundreds of women and other family members traveled to Mexico City on the National March for Dignity to demand that the government locate their loved ones gone missing in the drug wars, according to the Frontera NorteSur news service. "They took them alive, and alive we want them," the marchers chanted. While the drug wars in Mexico have claimed at least 50,000 lives, including 49 people whose dismembered bodies were found on a highway outside Monterrey Sunday morning, thousands more have gone missing, either simply vanished or last seen in the hands of armed, uniformed men. 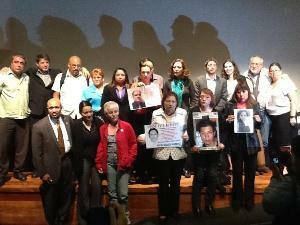 The Mexican government doesn't report on how many have gone missing in its campaign against the cartels, but the Inter-American Human Rights Commission counts more than 5,000 missing persons complaints filed with police -- and this in a country where many people so mistrust the police they don't bother to file official reports. "For some it has been years, for others months or days, of walking alone, of clamoring in the desert of the hallways of indolent and irresponsible authorities, many of them directly responsible for disappearances or complicit with those who took our loved ones away," the mothers' group said. On Mother's Day, many mothers in Mexico have "nothing to celebrate," said Norma Ledezma, cofounder of Justice for Our Daughters in Chihuahua City. "As families, we want to take this occasion to tell society not to forget that in Mexico there is home with a plate and a seat empty." "We have walked alone in the middle of stares and stigmatizing commentaries, and we have been treated like lepers, marginalized and condemned to the worst pain a human being could live: not knowing the whereabouts of our sons and daughters," the new mother's movement declared. "But now we are not alone. We have found hundreds of mothers and we unite our clamor and our love to recover our loved ones and bring them home." On Mother's Day, the agony of the drug war transcends borders. And the call from mothers for a more sane and human alternative continues to grow, from Chihuahua to Chicago and from Oaxaca to Washington. With states facing severe budget pressures, bills to require drug testing to apply for or receive public benefits -- welfare, unemployment benefits, even Medicaid -- have been all the rage at Republican-dominated state houses this year. Fail the drug test and lose your benefits. The bills carry a powerful appeal that plays well even beyond typically Republican constituencies, combining class, gender and racial stereotypes with a distaste for wasteful government spending. But they have also faced surprisingly tough opposition. "If you have enough money to be able to buy drugs, then you don't need the public assistance," Colorado Rep. Jerry Sonnenberg told the Associated Press in March after sponsoring a welfare drug testing bill. "I don't want tax dollars spent on drugs." "The message of this bill is simple: Oklahomans should not have their taxes used to fund illegal drug activity,” said state Rep. Guy Liebmann (R-Oklahoma City) in a statement on the passage of his welfare drug testing bill in the state House. "Benefit payments that have been wasted on drug abusers will be available for the truly needy as a result of this bill, and addicts will be incentivized to get treatment." Liebmann also struck another frequently-hit note -- a moral claim that such bills were necessary even if they didn't save taxpayer dollars. "Even if it didn't save a dime, this legislation would be worth enacting based on principle," he said. "Law-abiding citizens should not have their tax payments used to fund illegal activity that puts us all in danger." Such rhetoric has sounded in statehouses across the land, with bills for mandatory, suspicionless drug testing of people seeking public benefits introduced in almost half the states, even passing a couple -- Florida last year led the way (and this year passed a law mandating drug tests for state employees), and now Georgia this month has followed suit. West Virginia's governor has also instituted drug testing for enrollees in the state's job training program. But the most interesting trend emerging is how difficult it is to actually get them passed. While Georgia legislators managed to get a bill through, bills have already been defeated in nine states so far this year -- Alabama Hawaii, Iowa, Kentucky, Mississippi, South Dakota, West Virginia, Virginia, and Wyoming -- and a number of others are either dead in the water or running out of time as legislative session clocks tick down. The states where welfare drug test bills have not yet died include Colorado (House Bill 2012-1046) , Illinois (House Bill 5364), Indiana (House Bill 1007), Kansas (House Bill 2686), Oklahoma (House Bill 2388), Ohio (Senate Bill 69) South Carolina (House Bill 4358), and Tennessee (House Bill 2725), while a "reasonable suspicion" bill is still alive in Minnesota (Senate File 1535). Bills targeting unemployment benefits are still alive in Arizona (Senate Bill 1495) and Michigan (House Bill 5412), while one aimed at Medicaid recipients is still alive in South Carolina (House Bill 4458). The stumbling blocks for passage are threefold: First, there are serious reservations about the constitutionality of such bills. While the Supreme Court has not ruled directly on the subject of requiring drug tests of public benefits recipients, it has held that forcing someone to submit to a drug test is a search under the meaning of the Fourth Amendment and thus requires either a search warrant or probable cause. The high court has carved out only limited exceptions to this general rule, including people in public safety-sensitive positions (airline pilots, truck drivers), members of law enforcement engaged in drug-related work, and some high school students (those involved in athletics or extracurricular activities). The only federal appeals court ruling on drug testing welfare recipients came out of Michigan a decade ago, and in that case, a divided panel found such testing unconstitutional. That case was not appealed by the state. In Florida, the welfare drug testing law passed by the Republican legislature and signed into law by Gov. Rick Scott (R), has been stopped in its tracks at least temporarily by a federal district judge who has hinted broadly she will ultimately find it unconstitutional. Civil libertarians in Georgia have vowed to challenge its law as soon as it goes into effect. Democratic legislators across the country have used the fear of unconstitutionality as a potent argument against the drug testing bills. They have also raised the specter of legal fees reaching into the hundreds of thousands of dollars to try to defend such bills in the courts, and that leads to the second objection to public benefits drug testing bills: they will not save taxpayer dollars, but will instead waste them. "It's absolutely ridiculous to cut people off from potential benefits, especially when we've found that people on welfare aren't using their money to feed addictions," said Morgan Fox, communications manager for the Marijuana Policy Project. 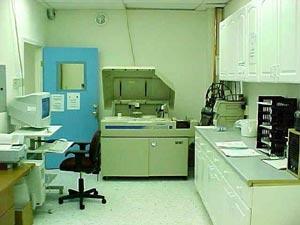 "In Florida, when they enacted their program, very few people tested positive. It ends up costing the state money to drug test." Fox was referring to findings reported last week that in the four months last year that Florida's welfare drug testing law was in effect, only 2.6% of applicants failed the drug test and fewer than 1% canceled the test. With the state reimbursing those who took and passed a drug test, the program was a net loser for the state, costing it an estimated $45,000 during that four-month period. The Florida findings are similar to the findings of an earlier Florida pilot program for welfare drug testing and the short-lived Michigan program, both of which reported very low rates of positive drug tests among their subject populations. While it appears that most public benefits drug testing bills being considered would be at best a wash when it comes to spending or saving taxpayer dollars, one unemployment drug testing bill, Senate Bill 1495 in Arizona, is likely to be doomed because it will trigger the withholding of federal tax benefits for business, costing Arizona businesses millions of dollars. That Republican-sponsored bill is now stalled in the House, and some normally staunch allies of the GOP are in the opposition camp. "Arizona is moving forward with this bill that the Department of Labor says violates federal law," said Bill Piper, national affairs director for the Drug Policy Alliance. "The trade-off for this testing is a pretty steep tax hike on local businesses, and the Chamber of Commerce is opposing it because they care about taxes. We're hoping that the Chamber in other states will look at that as well." A third stumbling block for public benefits drug testing bills is not legal or economic, but based on notions of justice and fairness. While Republican legislators talk about ensuring that taxpayer dollars aren't wasted on drug users, they seem decidedly disinterested in imposing drug testing burdens on recipients of taxpayer largesse who are not poor. They are not calling for the drug testing of beneficiaries of corporate tax breaks, for instance, and for the most part they are demonstrably uninterested in subjecting themselves to similar testing, although Democrats opponents of the bills have had fun and scored political points sponsoring amendments or bills to do just that in some states. In Colorado, Democratic foes of a welfare drug testing bill submitted an amendment to drug test legislators and state officials complete with personalized urine specimen cups for House committee members.That amendment actually passed the committee, but was largely symbolic because even if the bill passed in the House, it was doomed in the Democratically-controlled state Senate. Instead of the powerful, the bills target the most downtrodden and disadvantaged -- the poor, the sick, the jobless -- in the guise of helping them. They are part of a broader attack on the poor, some advocates said. "Whether you're talking about attacks on welfare, abortion, or contraception, it's all connected," said Lynn Paltrow, executive director of National Advocates for Pregnant Women. "Depriving low-income people, predominantly women, of basic financial support is part of creating a second class status for all women. Women can't make healthy decisions about their reproductive lives if they don't have enough food to eat for themselves and their children," she argued. For Paltrow, the push for drug testing the poor "has been part of a concerted effort to undermine the notion of the social contract" that is ideologically-driven and mean-spirited. "Whether it's poverty or pregnancy, you make every problem one having to do with individual responsibility, and then you create a justification for taking away money from people who need it." It's part of a larger move to privatize what should be public welfare and services, Paltrow argued. "You're transferring money from poor people to companies that do drug testing," she said. "That's an important part of trickling up all our money to the fewer than 1%." While Paltrow saw malign forces at work, Piper could identify no grand conspiracy. "We couldn't find any think tanks currently pushing this or any other common denominator in all the states other than that this gets media attention," he said. "Some dumb legislator reads something in the newspaper and decides to do it in his state. We don't see any indication the drug testing industry is pushing this. If there's a conspiracy, it's a conspiracy of stupidity, that's all." There is another fairness issue in play as well. The rhetoric surrounding the politics of drug testing the poor suggests that it is aimed at mothers strung out on heroin or meth-ravaged fathers, but the most common drug cited in the failed Florida drug tests was marijuana. That gets the goat of the MPP's Fox. "Considering that occasionally using marijuana is not going to affect your ability to be a productive member of society and that it has a low addiction potential, marijuana consumers are being kind of discriminated against," he said. "People who, for ideological reasons, would rather drug test everyone than pay for the welfare of a few people, especially when it's marijuana, why, that's just patently ridiculous." Republican legislators may have thought they had a no-brainer of an issue with mandating drug tests for public benefits recipients, but for the reasons mentioned above, the going has been tougher than they expected. That doesn't mean no more such bills are going to make it through the legislative process -- one is very close in Tennessee -- but it doesn't suggest that pandering to stereotypes and prejudice isn't as easy a sell as they thought. Legislators in some states have also responded by more narrowly crafting drug testing bills in hopes of passing constitutional muster. A Utah bill now signed into law requires drug tests for welfare recipients upon suspicion, and more such bills are in the pipeline, although they face the same ticking clocks as the more broadly drawn drug testing bills. While the Republican offensive has been blunted, the battle is not over. "I remain concerned that more states will pass stupid drug testing legislation, but still optimistic the courts will strike them down. They're trying to make them suspicion-based and less random, but even that may or may not pass court scrutiny," said Piper. "This recession can't end quickly enough," he sighed. "When the economy is bad, they need to find scapegoats. Still, this isn't passing in most states, and to get bills passed, it may be that they have to water them down to the point where they're just not that effective." Monday's federal raid on Oaksterdam University in Oakland has ignited a firestorm of criticism of heavy-handed federal efforts to clamp down on medical marijuana distribution. Meanwhile, battles continue to be fought from Washington, DC, to local city halls. On Monday, lawmakers from five states urged the Obama administration to back off from its policy of interference in state medical marijuana programs. The lawmakers are Assemblyman Tom Ammiano (D-CA), Sen. Jeanne Kohl-Welles (D-WA), Rep. Antonio Maestas (D-NM), Sen. Cisco McSorley (D-NM), Assemblyman Chris Norby (R-CA), Rep. Deborah Sanderson (R-ME) and Sen. Pat Steadman (D-CO). They called on President Obama to live up to his campaign promise to leave the regulation of medical marijuana to the states, adding raids would only "force patients underground" into the illegal drug market. "Please respect our state laws," the lawmakers wrote. "And don't use our employees as pawns in your zealous and misguided war on medical marijuana." On Tuesday, former New Mexico Gov. Gary Johnson criticized the Oaksterdam raids, saying the Obama administration needs to "find better things to do with our tax dollars than raiding Richard Lee's home in selective enforcement of a bad law." Johnson, who governed as a Republican, is seeking the Libertarian Party presidential nomination this year. On Wednesday, six national drug policy groups called on the Obama administration to end its assault on medical marijuana providers. They were the Drug Policy Alliance, Law Enforcement Against Prohibition, the Marijuana Policy Project, the National Cannabis Industry Association, the National Organization for the Reform of Marijuana Laws, and Students for Sensible Drug Policy. "You have turned your back as career law enforcement officials have run roughshod over some of the most professional and well-regulated medical marijuana providers," the groups said in a letter to President Obama, Attorney General Eric Holder, and drug czar Gil Kerlikowske. "We simply cannot understand why you have reneged on your administration's earlier policy of respecting state medical marijuana laws… "We hope that you will immediately reconsider your drug control strategy and will work with, not against, states and organizations that are attempting to shift control of marijuana cultivation and sales, at least as it applies to medical marijuana, to a controlled and regulated market." Last Monday, three San Francisco supervisors expressed concerns about the city Health Department's stance on medical marijuana. Supervisors David Campos, Scott Wiener, and Christina Olague signed on to a letter to the department questioning "some recent media statements" from the department, especially regarding its decision -- since rescinded -- to ban edible medical marijuana products. Last Thursday, collective members in Murrieta said they were being targeted by police. The conservative Riverside County town is in an ongoing fight with the Green House Cannabis Collective, and collective members told Fox LA that police were pulling them over on pretexts to search their vehicles. One patient and volunteer showed Fox LA a GPS tracking device he found attached to his vehicle after being pulled over by police. The property owner of the collective said he was being fined $109,000, but that city officials offered to drop the fine if he would evict the collective. City officials had no comment, but one told the station off-camera that they don't want marijuana businesses in their city. Period. Also last Thursday, an Arcata woman sued the city and the police over a raid at her home. Barbara Sage, 64, alleges that officers had an unlawful search warrant and used excessive force in investigating marijuana cultivation at the residence she shared with her husband. She argues that police didn't have sufficient probable cause for the search because they failed to present any evidence that the Sages' suspected marijuana cultivation fell outside the bounds of state and local medical marijuana laws and regulations. The Sages had grown medical marijuana in compliance with state law and local regulations, but were not growing any when police arrived. Aside from the probable cause issue, Sage argues that police violated the "knock-notice" rule, which requires them to announce their presence and that they are serving a warrant when entering someone's home, and that Hoffman failed to include a statement of expertise and qualifications to support the warrant. She also claims officers used unnecessary force when they came into her home with guns drawn, allegedly pulled her sick husband from bed -- tearing oxygen tubes from his nose -- and put him on the ground in handcuffs. "This rough treatment affected his mood drastically, and he went into a state of depression after the search that hastened his death," the suit claims. Last Friday, an appeals court ruled that a dispensary does not owe the city of Dana Point $2.4 million. The city had shut down the Beach Cities Collective in January 2011, alleging violations of building codes and state law, and the two sides have been embroiled in lawsuits ever since. The city won the $2.4 million summary judgment from an Orange County Superior Court judge, but the 4th District Court of Appeals threw out the judgment, finding that it was improper because the facts in the case are still in dispute. The city has spent $400,000 trying similar tactics against two other dispensaries. Once there were six dispensaries in Dana Point; now, there are none. Also last Friday, Vallejo police raided the same dispensary for the second time in a month. Police hit the Better Health Group and arrested owner Jorge Espinoza, 25, and three workers on suspicion of selling marijuana. That makes the fourth dispensary raid in the city since February 21. Better Health was raided the first time on February 29. The city has passed a measure to tax dispensaries, but its police continue to raid them anyway. 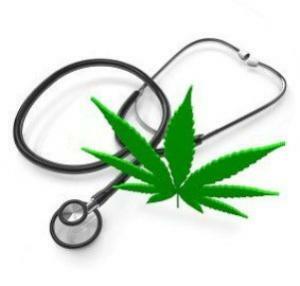 Also last Friday, medical marijuana regulation initiatives were announced in five cities in the San Diego area. The cities are Encinitas, Del Mar, Solana Beach, Lemon Grove and La Mesa. The proposed ballot measures largely mirror one planned for the city of San Diego. All are being coordinated by Citizens for Patient Rights in connection with the Patient Care Association, a trade organization of and for nonprofit dispensaries. None of the five cities currently allow medical marijuana dispensaries. A judge last year ordered the lone collective in Del Mar closed. A separate group of medical marijuana supporters has launched a citizen-initiated petition to reverse a dispensary ban in Imperial Beach. On Saturday, San Francisco's HopeNet Cooperative stayed open in defiance of federal threats. US Attorney Melinda Haag had warned the dispensary's landlords it had to close by last Friday or the property could be seized and the owners imprisoned. Similar letters from Haag have led five other San Francisco dispensaries to shut down since October 7. The letters warn of 40-year prison terms and asset forfeitures if the "marijuana distribution" is not stopped. On Monday, DEA and other federal agents raided Oaksterdam University, associated businesses, and the home of Oaksterdam founder Richard Lee. Lee was briefly detained, but later released without charges. DEA and IRS agents accompanied by US marshals seized seedlings, computers, and records, effectively shutting down the school, although it has vowed to reopen. Oakland police had to provide crowd control for the feds as angry emergency response protestors spilled onto Broadway. On Tuesday, hundreds of medical marijuana supporters rallied in San Francisco. Although the rally had been planned in advance of Monday's Oaksterdam raids, the federal assault on the movement icon energized and outraged attendees, who marched from city hall to the federal building to tell US Attorney Melinda Haag to knock it off. The rally drew support from city supervisors, state legislators, and state officials. Also on Tuesday, a Los Angeles judge denied a business license for a medical marijuana testing lab. Golden State Collective Cannabis Laboratories had sought the license, but was denied by city officials. A Los Angeles Superior Court judge upheld the city's decision. 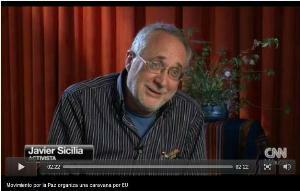 On Wednesday, Los Angeles NORML director Bruce Margolin announced he is running for Congress. 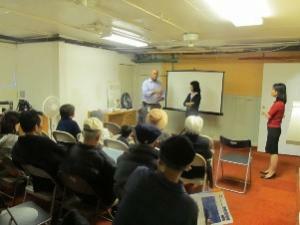 He is challenging veteran Democratic Congressman Henry Waxman in the newly created 33rd District. He emphasized ending the failed war on drugs in his announcement. Also on Wednesday, a Butte County judge denied a motion to suppress the evidence in a medical marijuana case that is fueling outrage over the seizure of children from their parents. Daisy Jean Bram and Jayme Jeff Walsh are charged with marijuana cultivation and sales as well as child abuse charges -- apparently for nothing more than having children in a home where marijuana was being grown. Earlier, a judge had thrown out the child abuse charges, saying there wasn't sufficient evidence for them, but Butte County prosecutors refilled them. The children have since been returned to Bram's care. On Tuesday, Gov. Jan Brewer (R) signed a bill barring medical marijuana on college campuses. The law prohibits the possession or use of medical marijuana at public universities, community colleges, and child-care facilities. The bill was the brainchild of Rep. Amanda Reeve (R-Phoenix) and was supported by prosecutors. Medical marijuana advocates foresee a legal challenge on state constitutional grounds. On Tuesday, the state announced it is cutting its medical marijuana regulatory staff because the state isn't collecting enough revenues from licensing fees to pay for them. The Department of Revenue said it would lay off 20 of 37 staffers at the Medical Marijuana Enforcement Division. The department blamed the shortfall on a state moratorium on medical marijuana licenses, which is set to end this summer. Last Wednesday, Portland saw its first dispensary open for business. The dispensary will eventually serve about 100 patients. It is the second Wellness Connection of Maine dispensary to open in the state. Last week, the House Judiciary Committee approved four medical marijuana bills that compromise patients' rights. The Marijuana Policy Project says it will absolutely oppose one and will oppose two more if not amended. Click the link above for details on the bills. On Tuesday, four medical marijuana providers suing the federal government were arrested on federal drug charges. The attorney representing the four in their civil lawsuit over last year's raids on medical marijuana businesses across the state said they were indicted on Tuesday and last Thursday. The lawsuit challenging the constitutionality of the searches of more than 26 homes, businesses and warehouses is before the 9th US Circuit Court of Appeals. Their claim was rejected by a district judge in January. Last Wednesday, the Ohio Medical Cannabis Amendment campaign held a press conference to kick start its signature-gathering effort. They have until July 4 to turn in 385,000 valid voter signatures in order to make the November ballot. Last Friday, DC officials selected six growers for the city's medical marijuana program. Later this summer, the city will select up to eight dispensary operators. By then, the chosen growers should have a crop to provide to the dispensaries, and the law approved by voters in 1998, but blocked by Congress until 2009 will finally be in effect. Also on Friday, the weGrow medical marijuana superstore opened on Rhode Island Avenue NE. The supplier of lights, hydroponic equipment and other growers' goods advertises itself as "the one-stop-shop for the products and services one would need to grow plants indoors -- from tomatoes to medical marijuana."